Vatican City: Pope Francis on Friday accepted the resignation of Cardinal Donald Wuerl, the archbishop of Washington, a moment many victims of clerical abuse had hoped would demonstrate his commitment to holding bishops accountable for mismanaging cases of sexual misconduct. But instead of making an example of Wuerl, who was named in a recent Pennsylvania grand jury report that accused church leaders of covering up abuse, Francis held him up as a model for the future unity of the Roman Catholic Church. The pope cited Wuerl's "nobility" in volunteering to resign and announced that the 77-year-old prelate would stay on as the archdiocese's caretaker until the appointment of a successor. 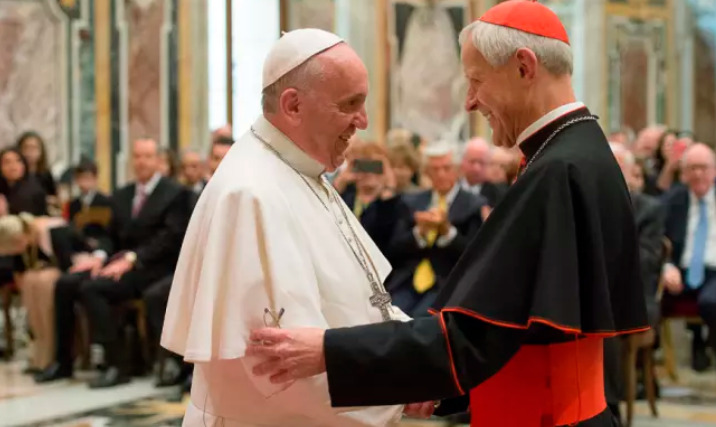 In an interview, Wuerl said that he would continue to live in Washington and that he expected to keep his position in Vatican offices that exert great influence, including one that advises the pope on the appointment of bishops. For some Catholics, Friday's decision was a deep disappointment on an issue that has shadowed Francis's papacy and threatened his legacy. After he became pope in 2013, Francis appointed a commission to advise him on safeguarding children from abuse, agreed to create a tribunal to try negligent bishops and spoke of "zero tolerance" for offending priests. But critics say Francis has been more talk than action. By making it clear he thought Wuerl had served the church well, they said, Francis sent yet another mixed message on a topic that has shaken faith in the church's leadership around the world. "It doesn't sound like the pope has gone far enough at all," said Mary Pat Fox, president of Voice of the Faithful, a national group that advocates for abuse victims and church accountability. "They're removing him from this situation where people feel betrayed, but he's still got all the power pretty much that he ever had." It was not the first time Francis seemed to reveal a blind spot on the issue of sexual abuse. This year, he initially defended Chilean bishops against accusations that they had covered up abuse. He later listened to those who were abused, said he believed them and started removing bishops. Until just a few months ago, Wuerl was seen as a reformer and a leader in the church's response to sexual abuse. Then, in August, a grand jury in Pennsylvania detailed widespread clerical abuse over many decades, including accounts of Wuerl's poor handling of accusations against priests when he was the bishop of Pittsburgh. The report, which mentioned Wuerl's name more than 200 times, said he had relied on the advice of psychologists to permit priests accused of sexually abusing children to remain in the ministry. Still, the Archdiocese of Washington on Friday released a letter from Francis, saying that Wuerl had sufficient evidence to "justify" his actions as a bishop and to "distinguish between what it means to cover up crimes or not to deal with problems, and to commit some mistakes." "However," Francis' letter added, "your nobility has led you not to choose this way of defense. Of this, I am proud and thank you." The erosion of Wuerl's standing was compounded by his association with his predecessor as archbishop of Washington, Theodore McCarrick. He recently stepped down from the College of Cardinals over accusations that he had molested an altar boy decades ago and coerced seminary students to share his bed. In an extraordinary letter released in August, the Vatican's former ambassador to the United States, Archbishop Carlo Maria Viganò, accused Francis of covering up inappropriate behaviour by McCarrick and called on the pope to resign. In the weeks since, Francis has alluded to Viganò's letter, to which he has said he will not respond, by speaking of the devil's role in trying to divide the church. He seemed to do so again in Friday's letter, warning against the "sterile division sown by the father of lies who, trying to hurt the shepherd, wants nothing more than that the sheep be dispersed." Francis saw Wuerl as that shepherd, a force for unity. The cardinal's September 21 request that the pontiff accept his resignation reflected his dedication to "procure the good of the people entrusted to your care," Francis wrote. Wuerl called the pope's letter a "very, very beautiful" recognition of his effort to put his flock before himself, but added that the pope, in choosing his replacement, would select a bishop who began serving after the American church adopted new guidelines in 2002 to prevent and punish abuse. He said he was "stepping aside to allow for new leadership that doesn't have this baggage." Wuerl had previously offered his resignation at age 75, as is customary in the church, but he was allowed to stay on in Washington, where he had served since 2006. In accepting his resignation now, Francis asked that Wuerl remain as the apostolic administrator of the archdiocese. Wuerl, who is considered a moderate and a supporter of Francis' style of papacy, spoke in the interview about the constructive role he hoped to play at the annual meeting of American bishops in November. "We are going to each be asked to speak our mind on what we think needs to be done," he said. And as a member of the Congregation for Bishops, Wuerl will still shape the American church for decades to come by helping to pick its bishops. Edward McFadden, a spokesman for Wuerl, said that during the cardinal's 12 years in Washington, "not a single priest of the Archdiocese of Washington has faced a credible claim, and there is not today a single priest in ministry in Washington who has faced a credible claim." And during the cardinal's 18 years as bishop of Pittsburgh, he said, "there were no cover-ups of claims of abuse." Wuerl's simultaneous resignation and rehabilitation by the pope is likely to enrage conservative Catholics who have been using the sexual abuse scandal to try to bring down prelates close to Francis. Wuerl was first seen as a rising star in the Catholic hierarchy decades ago, when he appeared to risk his career to report an abuse case. He arrived in Pittsburgh, a possible steppingstone to greater things, in 1988, just as the diocese had removed two priests accused of molesting altar boys. In his first months as bishop, after the priests were charged with more than 100 counts of abuse, he formed a review board at the diocese level. He also sought an extension to the statute of limitations on child sexual abuse cases in canon law. In 1993, when John Paul II was pope, Wuerl traveled to Rome, where he successfully persuaded the Vatican to overturn the reinstatement of an abusive priest. But cases from that era ultimately forced him to resign. Wuerl initially tried to defend himself from charges in the Pennsylvania report, posting an online rebuttal on TheWuerlRecord.com that was quickly taken down after drawing criticism and ridicule. He gave an interview to a local television station, saying that the cases had occurred in the 1980s and 1990s, before the church had developed clear policies on clergy sexual abuse. "I think I did everything that I possibly could," Wuerl said in the television interview. But it soon became clear that he would become the biggest target of outrage over the Pennsylvania report. "The grand jury report showed that Cardinal Wuerl oversaw and participated in the cover-up," the Pennsylvania attorney general, Josh Shapiro, said in an interview. "It is well documented."